Latin Rock Bands | RJAE HAAS BAND - Visit Today! When outstanding musicians with a genuine love for great Blues music, good times, and total quality entertainment come together to bring you some of the best musical performances you've seen in a long time, you just know you're watching one of the best bands for hire! Covering fantastic music of Stevie Ray Vaughan, Jimi Hendrix, Eric Clapton and our list goes on. We love Latin Rock.So much that we cover Selena’s last concert and a huge repertoire of Latin Rock rhythms from Santana. Latin music has always found a spot on the main stage of this country's popular music scene and we put our all into making it sound the best and us working alongside with some of the bays best musicians makes us really ROCK! We do not take the phrase “Classic Rock” lightly or for granted. We cover those unforgettable music tunes from the 50’s, 60’s, 70’s and 80’s that you’ll recognize. Songs from the Beatles, Pink Floyd, CCR, Peter Frampton, Lynyrd Skynyrd and more! BEING THE MOST VERSITILE BAY AREA BANDS FOR HIRE, WE OFFER A MULTITUDE OF DIFFERENT SERVICES TO BEST BRING YOUR EVENT TO LIFE. Whether you have an inquiry about booking us or just want to say hello! "I can't say enough about these guys! What a ROCKIN Band!" "The RJae Haas Band was phenomenal, my entire party enjoyed all of the music they played!" "Awesome party the cover tunes were as good as the originals!" "Great Band had lots of fun, my friend and I even got to play a song with them!" 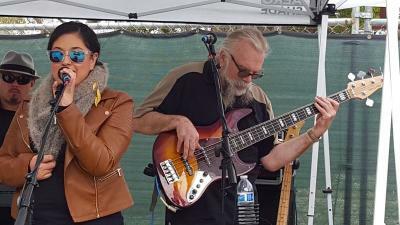 "Booked the band for my 4th of July party & BBQ, they were awesome and played a great variety of music. My guests were impressed and loved it!" "This is the second time we have used the band, we just love them and are already planning our next party"
We loved the RJae band so much for our first party that we organized a SECOND party just few weeks later so that we could get them back again and enjoy all that great music. You can't go wrong if you book these guys! And the light show they brought was fantastic. Everybody had a great time late into the evening. We had a small space for them to fit into, and they did a great job. The sax, keyboards and percussion give them a really BIG sound on top of outstanding guitar playing. This is a full band of really excellent musicians. And with a manager, all the org is super easy. My husband and I first heard this band in 2014 at a house party, and they rocked. I hired the band for my husband's 60th birthday, and they were spectacular. My guests of over 40 people really enjoyed the entertainment. They all asked for the band's card. The band added an additional female singer and she is awesome. I will be looking up the RJae Haas Band event schedule to find out where they are playing next. Look this band up and hire them. You will NOT be disappointed. Thank you RJae Haas Band for a spectacular show. The RJae Haas Band put on a great show for my wife’s birthday party. The band played a variety of classic rock with a blues/Latin flavor. Our guests kept asking us, “Where did you find this band? !” A special shout out goes to RJae, he is an awesome guitarist with great stage presence. In addition, the band was happy to accommodate a guest of ours who played a few songs with them. Great night, great fun. We will be following the band and looking forward to seeing these guys again. These guys are great! We danced all night! Very impressed with the band. All the members were awesome and Rosemary was very pleasant to work with. I would definitely use them again, what a great performance! It was a pleasure to have the RJae HAAS Band as part of the Hollister Rally. I would recommend the band for other festival and fairs. 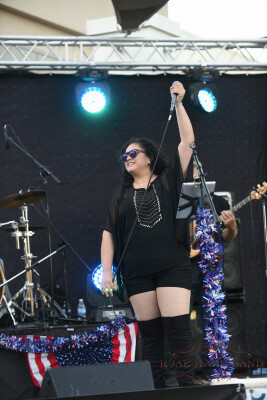 This makes twice that members of Rjae Haas Band have played the Alameda Business Association's annual July 4th Rose, White & Blue Parade. Each time they've gone the extra mile and played in both the procession itself and then, without a break, pulled in at the festival and warmed up the crowd with their well-crafted covers and original material. Our 30,000 strong audience response was tremendous, both in the parade plus afterwards, and Rjae Haas Band made sure our festival was kicked off in style. It's a great pleasure, and speaking as a musician, to note the consistently high quality of their output. This would be all fives except I've seen The Who & Led Zeppelin. Great band! Great music! Very nice people too... would definitely hire them again. thanks again! 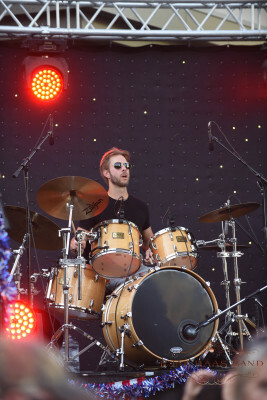 RJae Haas Band was a great hit at the Oakland First Fridays event. We had about 10,000 folks come through, and I saw a lot of happy faces of people as they listened to this great band.